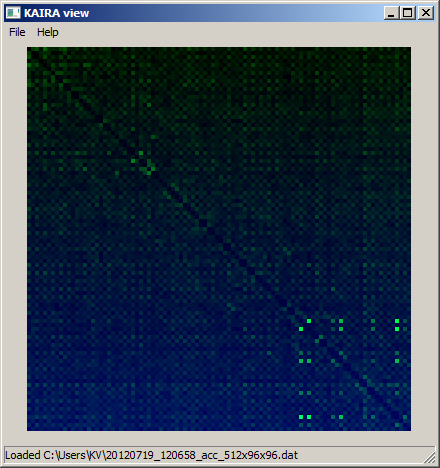 We are now routinely collecting data from KAIRA's High-Band Antenna (HBA) array. This operates in one of several receiver unit (RCU) modes which, with the use of filters and clock rates, allow us to get at different Nyquist zones in the spectrum. Most of the initial experiments that we are doing at with RCU mode 5 (which is approximately 110-190 MHz). There is one RCU per signal path. That is, one RCU per polarisation per antenna. 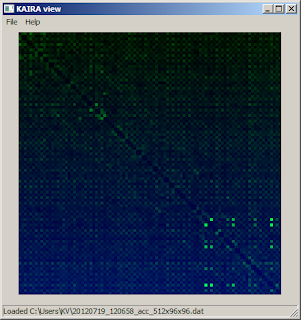 For the KAIRA HBA array, we have 48 antennas (the tiles) and each one has 2 polarisations (linear X and Y) and we have 96 RCUs to process all of these. The following plot shows an antenna cross-correlation (ACC) matrix. The two axes are the RCU numbers, from 0 to 95 (from left to right and from top to bottom). The shading is the level of correlation. The auto-correlations have been set to zero to make the plot more useful. Auto-correlations are what you get if you correlate an RCU with itself. Because this obviously will have a very strong correlation, these data would otherwise dominate the dynamic range of the plot, which is why they are clipped to zero for normal viewing. KAIRA HBA(5) subband 240, just after midday UTC on 19-Jul-2012. In the grand scheme of things, these data are really just an intermediate step along the way to getting the system calibrated and producing data streams from on-sky beams, or all-sky images. However, it is an important matter and being able to produce this sort of display is a very encouraging step towards the realisation of a fully working system. It represents the culmination of a lot of hard work and effort by a lot of people, from SGO, ASTRON and elsewhere and everyone involved should take heart that we are getting close now and that their endeavours are appreciated. Calibration and commissioning work will be continuing this week. Hopefully we should have some even more interesting results to show soon!